Valentine’s Day is approaching so here’s a way you can celebrate this love day, if you are in early recovery. Valentine’s Day carries emphasis in making sure you are paying attention to your mate, being thoughtful and considerate of their needs, giving them a little gift of affection that demonstrates how much you love them and care for them, and being extra kind by going out of your way for them as a show of commitment and determination. All of these things are wonderful and should be attempted, however, when you are in early recovery it is advisable that you avoid getting into a new relationship. What happened while you were in your active addiction is that you didn’t care. You didn’t care about your appearance, you didn’t care if you ate, you didn’t care if you slept, you didn’t care about your health, and you certainly did not care about treating yourself every now and then to a special night of self-care such as a movie. You simply didn’t care about you. Living a life of recovery brings about many changes that require invaluable recommendations that will help you stay sober. One in particular that I would like to share and something to think about this Valentine’s Day, learn to date yourself for the first year in recovery. That’s right, Date Yourself! There is a lot of extra time earned when you stop using. This extra time allows you to become aware that you may not know what you like in regards to fun, what your strengths are, hobbies and activities you may be fabulous performing and even career or education interests that you can pursue. It’s an exciting time but can be confusing as well. Take this time to treat and date yourself: be kind and supportive with your self-talk, buy yourself an article of clothing that highlights your eyes, treat yourself to a movie, better yet, dinner and a movie, read or meditate at the beach, park or mountains, go walking, go jogging, train and run a marathon, take up yoga, journal, draw, or even go on a trip. The world is yours now. Enjoy it just for you by discovering what you can do and learn to love and appreciate this time without the need (and many times, the drama!) of a relationship. There are also a lot of thoughts and feelings that stem from this getting-to-know-me-phase. It’s a good time to be introspective on how far you’ve come and where you want to go in life. Think about this: the first year requires you to make so many personal changes. Why entertain a relationship with someone who is liking the YOU in transition? The first year is also greatly spent on continued work on your core issues. Why bring that or worse, distract yourself from working on you by perhaps fixing someone else’s problems or unexpectedly making them your own? 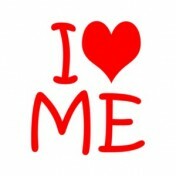 So this Valentine’s Day pat yourself on the back for getting sober, look into your own eyes through a big gleaming mirror and say three positive affirmations ( preferably daily) that begin with, “I am.” Go ahead and buy yourself flowers and chocolate because you are loving the new and improved you!